LiveCode LessonsLiveCode LessonsHow To - LiveCode Mobile Tasks LiveCode Mobile TasksHow do I use Push Notifications with iOS? 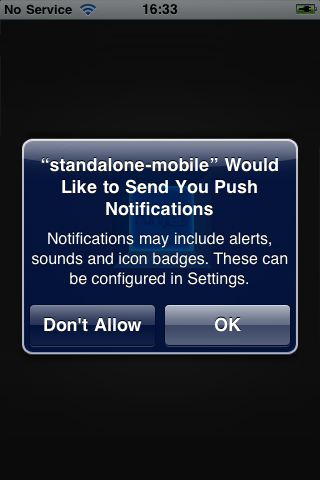 Push Notifications allow you to send notifications from a server directly to an iOS device. This reduces network bandwidth for applications that may normally poll a server at intervals, in order to receive an update on information the user may be waiting for. In order to set up Push Notifications, it is necessary that the devices register with the server. The server needs information on what device the notification is to be sent to. The device also needs to be able to receive the notification and act upon it. This communication between the server and the device is encrypted and requires appropriate keys and certificates to be created. This lesson is accompanied by a sample stack written by John Craig and uses the Json library by Mark Smith. The stack provides support for the certificate generation process and allows you to send Push Notifications from LiveCode. A demonstration on how to use the stack is provided by the author under the following YouTube link: http://www.youtube.com/watch?v=v7nR_aEAdKA. Note: Button Send Notification PWD and the Password field were added to the original sample stack to allow integration into the original lesson. This additional functionality allows you to supply a Passphrase for the Private Key when sending a notification to the server. Push Notifications occur over encrypted communication and involve a sequence of handshakes between the Push Notification Server and the iOS device. The handshakes take place very much in the background when using the LiveCode syntax, but you have to create the certificates and keys that are used for the encrypted communication. 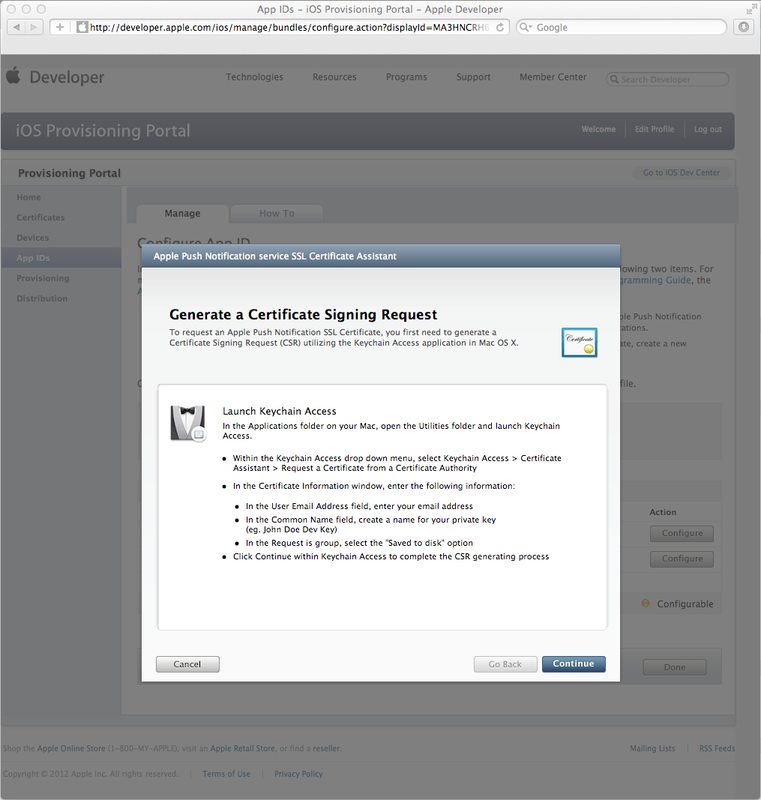 The certificate and key generation process follows standard steps via Keychain Access and the Apple Provisioning Portal. 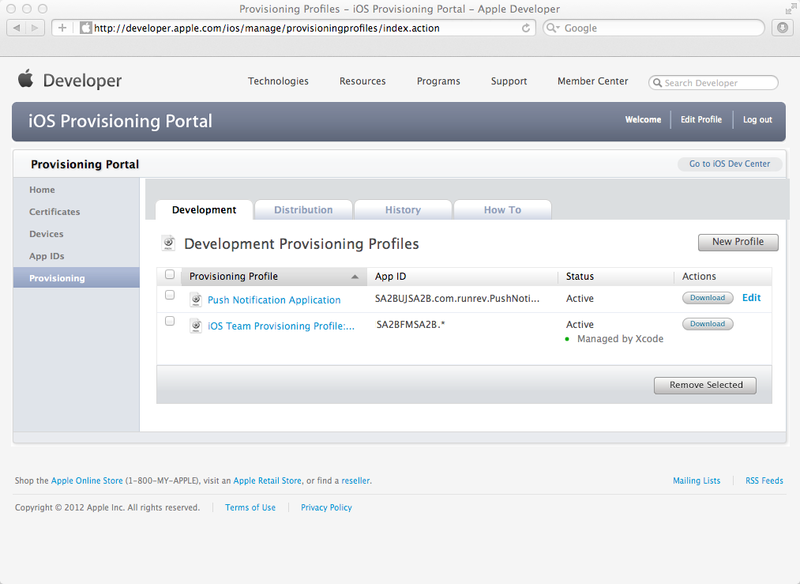 More information on this process is available in the reference material of the Apple Provisioning Portal. The first step is to create a Certificate Signing Request. Open the Keychain Access application on your Mac. This should be accessible under Applications/Utilities. Then select KeychainAccess -> Certificate Assistant -> Request a Certificate From a Certificate Authority... . This should launch the Certificate Assistant as is shown in this step. Fill in your e-mail address and the common name you are using for the application that is to support Push Notifications. 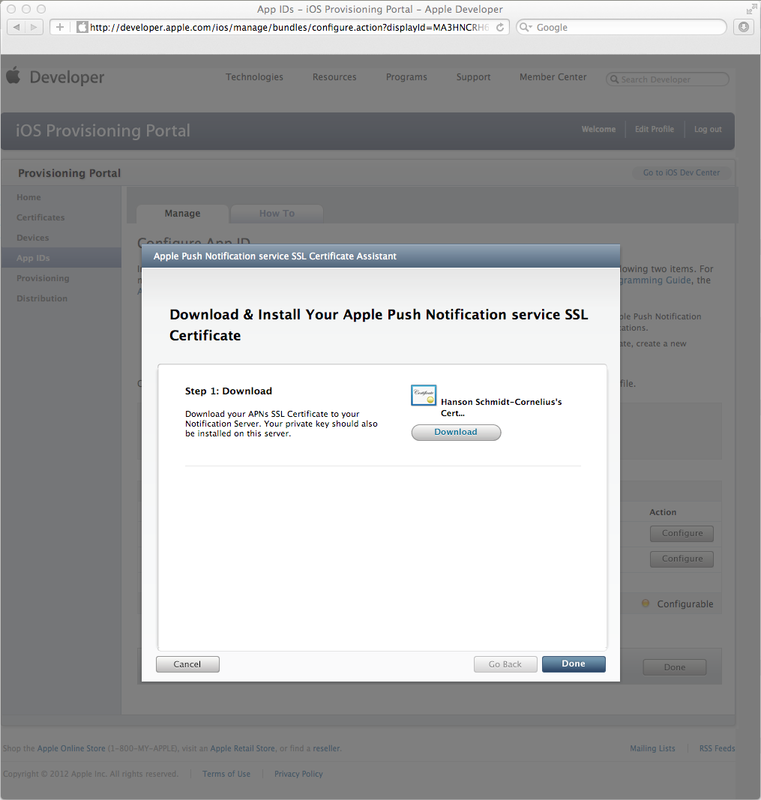 Note: Each new application that supports Push Notifications needs its own Certificate Signing Request. 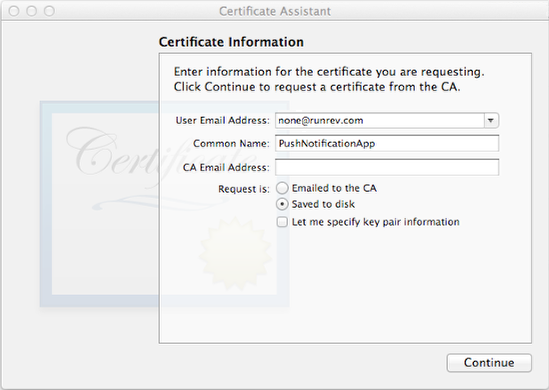 Note: Save the Certificate Signing Request into a common location for files that are specific to the application that is to support Push Notifications. Throughout this lesson, further certificates and keys are added to the same location. Once you have created the Certificate Signing Request for the Push Notification application, you can save the Private Key to your file system. Remain in the Keychain Access application and open the Keychain Access interface. Select login from the Keychains panel and Keys from the Category panel. The list window should now display the Keychain Keys. You should find a private key with the common name you provided when you created the Certificate Signing Request. Right click on the certificate and select Export "the common name". 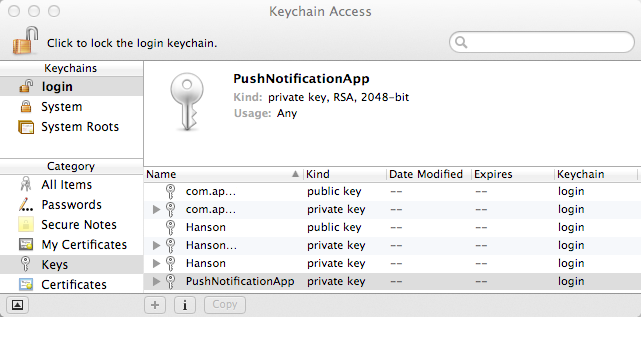 In this example the private key was saved as PushNotificationApp.p12. You need to enter a passphrase that protects the private key. 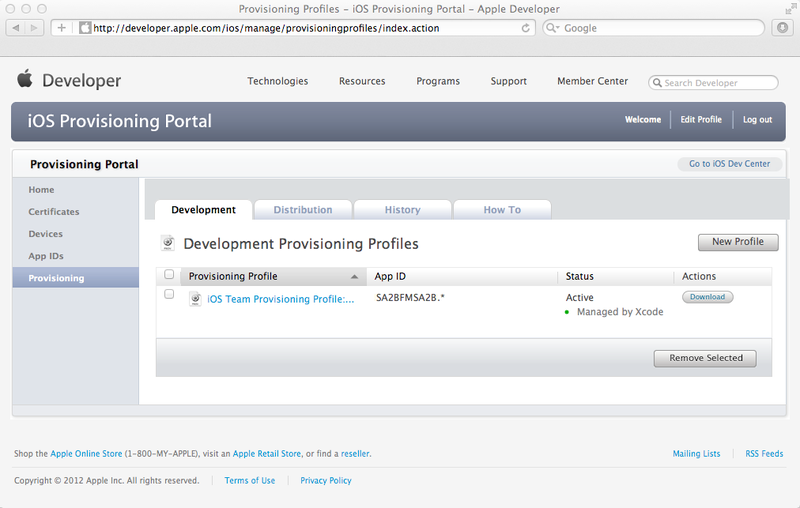 Log into the iOS Provisioning portal and select App IDs from the left panel and Manage from the top tab. This should provide you with a window that is similar to the one shown in this step. Enter the common name for the application that is to support Push Notifications. Then select the Bundle Seed and the Bundle Identifier. The Bundle Identifier is usually written as the reverse of a domain name with the application name post fixed. This may be your domain name and your application name. In this example, we are using the name: com.runrev.PushNotificationApp. Then select Submit. After selecting Submit, the screen is updated to reveal the Application ID. This is the Bundle Identifier you created, prefixed by an automatically generated code. Select the Configure link to ensure that the Application ID you created supports Push Notification. 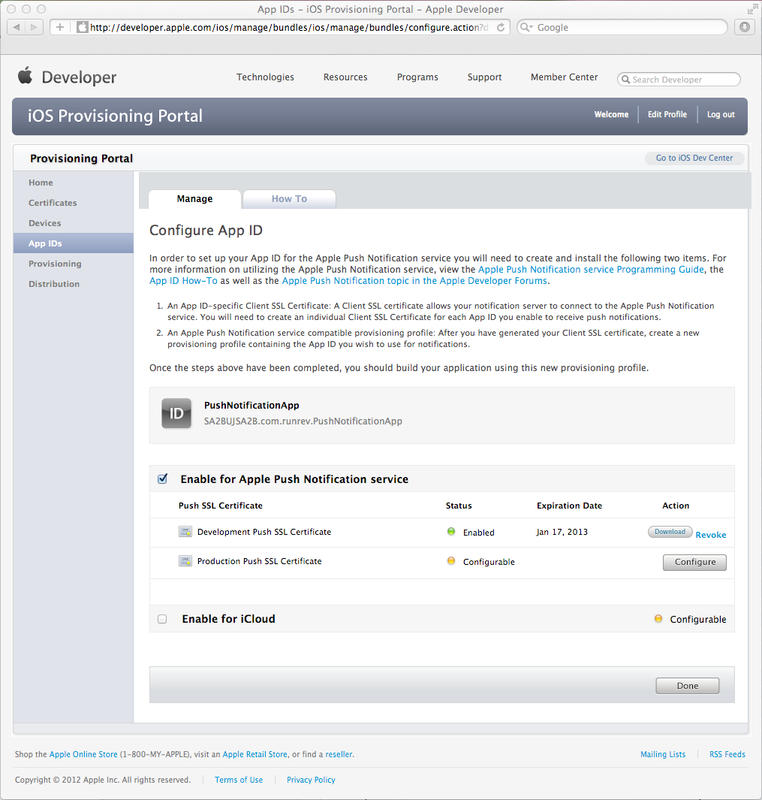 On the Configure Application ID page, ensure that the Enable for Apple Push Notification service tick box is selected. Then select Continue next to the kind of Push SSL Certificate you would like to use. In this lesson we are using the Development Push SSL Certificate for demonstration purposes. A final production application should use the Production Push SSL Certificate. The first window to appear when configuring the Push SSL Certificate displays a reminder that a Certificate Signing Request has to be created before it is possible to proceed. This step was already completed before we signed into the iOS Provisioning portal. Select Continue. The Submit Certificate Signing Request page provides a Choose File button that allows you to upload the Certificate Signing Request you created at the beginning of this lesson. Press the button next to the text no file selected and select your Certificate Signing Request. This file should have the extension *.certSigningRequest. Next select the Generate button for your Apple Push Notification service SSL Certificate to be generated. The screen changes to display an activity indicator and text to indicate that the certificate is being generated. Once the certificate has been generated, the activity indicator disappears and text is updated to indicate that the certificate is available for you. Select Continue. The dialog provides a Download button that allows you to download the certificate to your file system. The certificate name should look something like: aps_developer_identity.cer. Once you have downloaded the certificate, select Done. This completes the key certificate generation and we are ready to move on to the next stage. Now that you have created your certificates, you should test if they work. This step does not yet require you to implement a LiveCode application and can be executed from your Mac Terminal. In order to run the test you first have to create a PEM file that contains both, the Apple Push Notification Service SSL Certificate and your Private Key. Once this PEM file is created, you can test whether or not the certificates work. In order to use the certificates you generated, you need to create a PEM file that stores both, your Apple Push Notification Service SSL Certificate and your Private Key. You can create the PEM file from a terminal. Navigate to the directory that contains the certificates and key you generated earlier and execute the following steps. The file names here reflect the names of the certificates that were generated as part of this lesson. You have to update the syntax according the names you gave your certificates. At the end of this, you can enter some text and then select the return key. We entered the text "Hello World". This completes the communication with the server and verifies that our certificates work. Each application that supports Push Notifications requires its own Provisioning Profile. 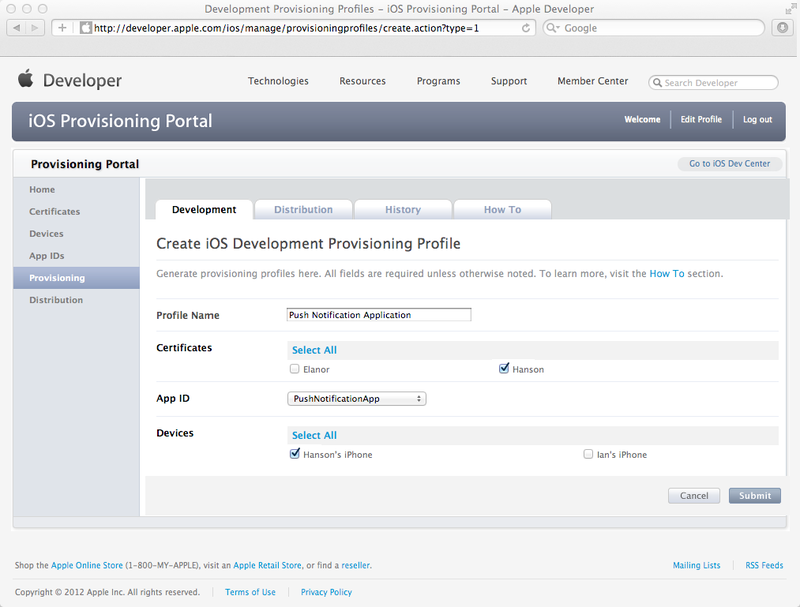 The following steps lead you through the process of creating the Provisioning Profile for your application. Log into your iOS Provisioning Portal and select Provisioning on the left hand navigation panel and Development from the top tabs. You should see the Provisioning Profiles that are available to you. At the very least, you should see your general iOS Development Profile for app development. 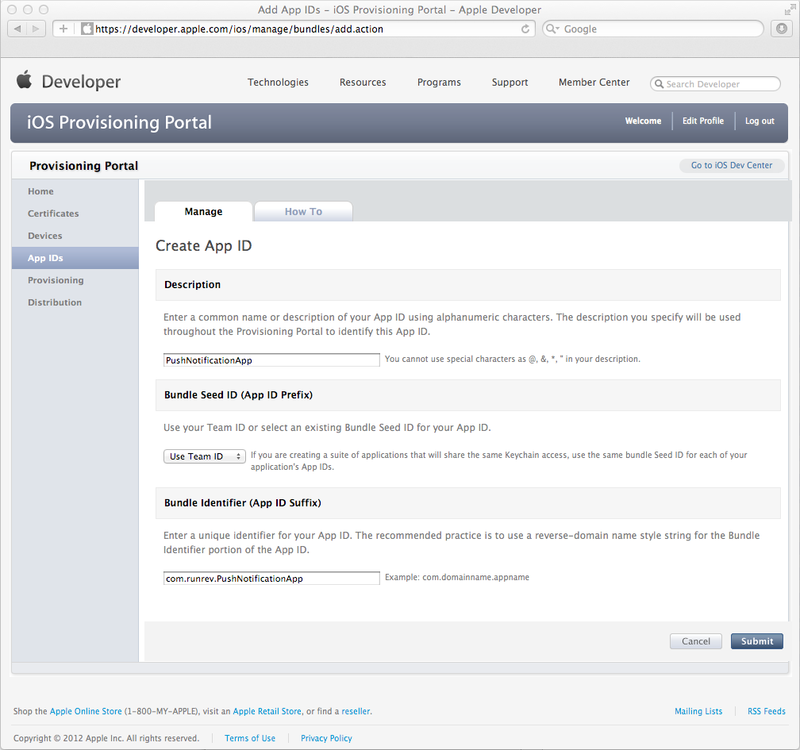 You now need to create a Provisioning Profile for the application that is to support Push Notification. Select the New Profile button. You are presented with a blank form for a new Provisioning Profile. Fill in the name of the application under Profile Name. Tick who the certificate should apply to. From the drop down list, select the App ID for the application. This information should already be available in the drop down list. Then select the test devices on which the Provisioning Profile should operate. Once you have provided all of the required information, select Submit. After you have created the new Push Notification Provisioning Profile, this profile may be in a Pending state. This state is only temporary and should change to Active within a few seconds. Try refreshing your browser to get the new states. The final step before you can add support for Push Notification to your application is to download the new Push Notification Profile and activate it on your Mac. In this example, the profile is called: Push_Notification_Application.mobileprovision. Double click on the profile, once it is downloaded, this makes it available for you to use. answer "Push Notification Message:" && quote & pMessage & quote with "Okay"
Note: Look this message up in the dictionary and follow links to related dictionary entries. The first time you start your Push Notification enabled LiveCode application you should get a message that is similar to the one shown here. The message only ever appears the first time the application is launched and does not appear again. This indicates that the iOS device is aware that the application can received Push Notifications and sets up the necessary parameters to allow notifications to be delivered to the application. If the user switched off Push Notifications for the application, then a dialog is displayed when the application starts up. This indicates that Push Notifications have been disabled. 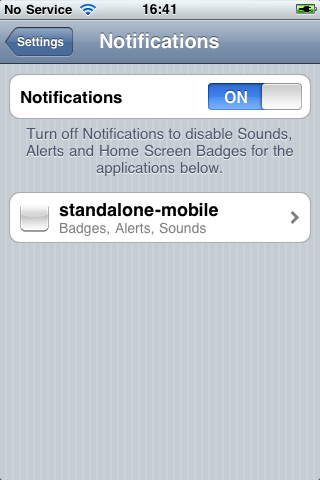 The user can configure the Push Notification Settings by selecting: Settings -> Notifications from their iOS device. This allows them to toggle supported features. answer the result with "Okay"
The Device Identifier is submitted to the server when registering for Push Notifications and provides the means by which the iOS device is identified when the notification is sent from the server. You can send a Push Notification from LiveCode using the sample stack that John Craig provided. We are listing a modified version of his server call code here to provide a comparative algorithm to the PHP code that is shown in the previous step. # Provide the Host Information. # Provide the Certificate and Key Data. # enter the key manually on the terminal -> remove relevant line from code). # Provide the Device Identifier (Ensure that the Identifier does not have spaces in it). # Replace this token with the token of the iOS device that is to receive the notification. # The message that is to appear on the dialog. local tAlert = "You have a LiveCode APNS Message"
# The Badge Number for the Application Icon (integer >=0). # The content that is returned by the LiveCode "pushNotificationReceived" message. local tPayload = "APNS Message Handled by LiveCode"
# Keep note of the current folder. # Convert to json - Mark Smith's library. # Build the binary notification to send. repeat for each item tCode in "0,0,32"
The following steps list some of the issues that were encountered when writing this lesson. If it was not possible to validate that the certificates work, then it is possible that you do not have access to the Push Notification Server. If you do not get the above response, then it is possible that you do not have internet access or a firewall is blocking your access to that server. If you do get this response, then it is possible that your certificates are not correct. Try debugging the process that you used to created the certificates. You may get a verify error:num=20:unable to get local issuer certificate message when trying to talk to the Push Notification Server. This is possibly the case if the Push Notification Server does not send the client certificates in the Acceptable Certificate Authority List. This message on its own does not indicated a problem with the implementation of LiveCode Push Notification Certificates. 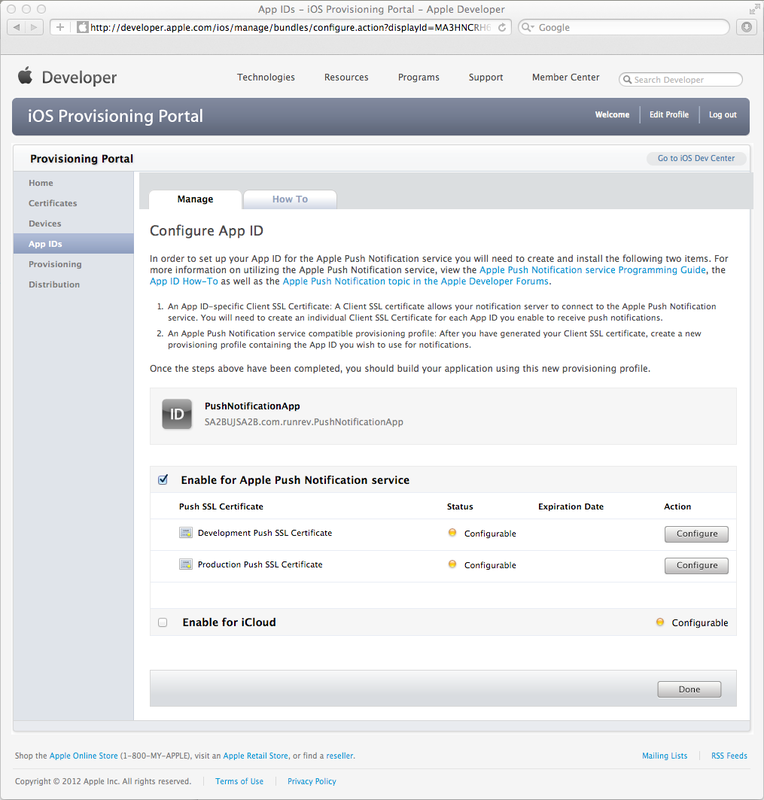 If you try your application, but you do not appear to have support for Push Notifications enabled, then this may be because the Provisioning Portal has not yet enabled the Certificate for your application. This problem has also been reported by a number of other developers. A recommended solution is to touch or force an update to the Push SSL Certificate for the application. You can do this by logging into the Provisioning Portal and navigate to the page shown here. Then unselect the Enable for Apple Push Notification service tick box and select it again. Then select Done. You are effectively not making any changes to the Certificate, but the update appears all that is needed for the Certificate to be recognized. Prev: How do I Develop iOS Code for Standard and Retina Devices? Next: How do I make my app scale to fit the screen on all devices? But thing I am not sure about is the token. Do I need to know each device token, which has my app installed and willingly to receive the notifications? In other words: Do I send push notifications to each device with a single command, or do I send the notification to my app users with a single command. When yes, how is this done? yes, when your application starts up on a device, you can read the device token. You will need to implement a mechanism that sends the token to your server. The token is unique to every phone that is running your application. You must push data out to every device using the keys of the particular devices that are to receive the message. The push notification feature is not a broadcast mechanism that allows you to submit to every device that is running your application. This means that you can also be selective on the devices that are to receive the message. Will the "Sending Push Notification (Livecode)" work in an app on the iPad? Since it uses a shell call? If not, How can this be done from within an iPad app??? I followed every step and all are excellent, the cert are ok, the connection are fine also I send the message from the php and I received the "Delivered Message to APNS", checked the internet, the ports everything work perfect, but (always there is a "but") I don't receive any message in my device, I changed 2 devices (iPhone 4/4S) I checked the code inside the app I able to receive push notification, checked the settings are ok, I have token (development/production) i test the device under development, all the provisional cert are good, but I don't know what happens, I checked every possible error and nothing. any advice, maybe something extra? no, you cannot run any shell commands on a iOS device. What you need to do is interact with a server that can do the shell calls for you. I have included two possible approaches. I would not recommend keeping the device identifiers of other peoples' devices on your device. So the first example is not one I would recommend, but would fit in with the requirements you have. Example 1 should probably be seen more as an academic investigation into a minimalist approach that should be expanded to fit your requirements. 1. Set up a server that is visible from the internet. 2. Create am iOS LiveCode script that passes relevant device identifier information to the server, including the message to be sent. 3. Execute the shell script on the server, using the data passed from your iOS device. 2. Set up a database on that server. 3. The database should contain people information and the device identifiers of their devices. 4. Implement a LiveCode stack for iOS that allows users to look for possible contacts on your server. 5. Create associations between people who know each other on the server. 6. Use the association information in posts to your server to activate push notification exchanges between people. You would have to ensure that appropriate registration and security measures are put in place so that the information of the users remains private. hmm, if everything is okay and works then all I can assume is that you have an error in the content of the variable tToken. This would allow you to talk with the APNS but you would not get a message on your device. I tried both, the PHP and the LiveCode implementation in this lesson and it worked for me. Have you had a look around the forums (http://forums.runrev.com/)? Maybe someone has come across the same problem. EXCELLENT Lesson! Thank you! I was able to get everything working perfectly. One question... say my app has 10,000 users and I want to send out a alert to all users. Do I make a stack that simply loops through each token and pass it to the php script on my server? 10,000 times? Won't something get overloaded? push notifications are not sent as a broadcast to all possible devices, but are sent as individual messages to particular devices, that are registered to receive a messages. This means that somewhere along the line there will be the need to send a message to every single devices. How this is scheduled and managed is very much dependent on how the server side application is structured. Sending a high number of push notifications may require increased bandwidth requirements and a potentially high CPU usage while the notifications are sent. With high volumes of notifications you also need to consider if and how much a services provider may charge for providing the services you need to send the notifications. we have not investigated how to integrate LiveCode push notifications with other vendors. I am not saying that it is impossible, but it is outside of the scope of a lesson here. 1. Find out what information is required in their payloads and see if you can replicate that with the LiveCode implementation. This may allow you to bypass their SDKs. 2. 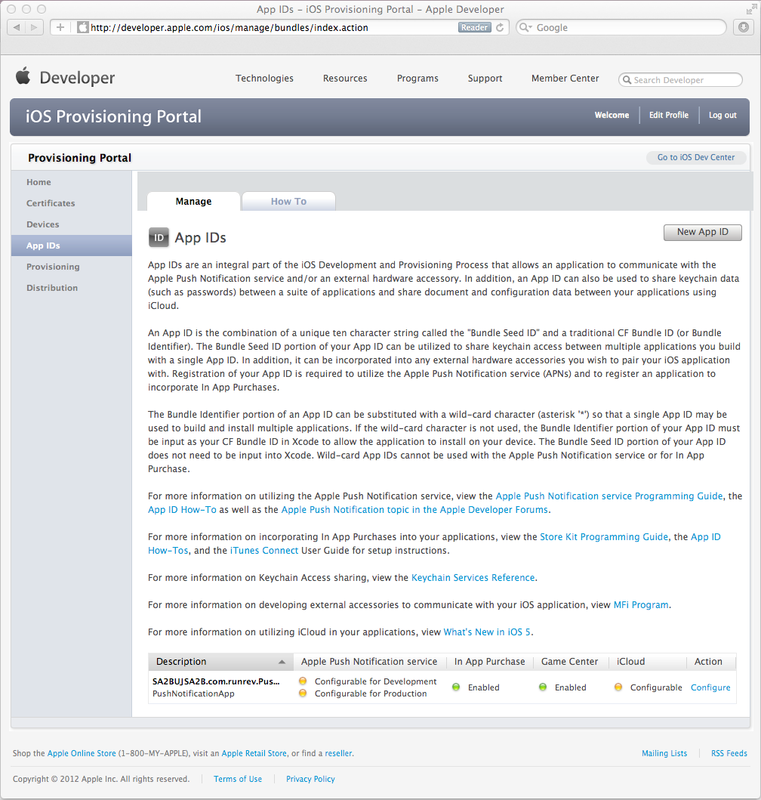 Consider creating an iOS external that incorporates the SDK they provide. This may cause clashes with methods that have already been implemented in LiveCode to handle push notifications. I cannot say if either of these approaches would work, but this is where I would start. Could you provide more info on the "server". Is this a commercial notification service? I assume that a push notification server is required and wouldn't the code to access that server depend on its implementation? The tutorial shows how to simulate a server, but what about the real world implementation? The server side of things really depends on the app. The lesson, it shows how to implement the server side code to send the notification, as well as the app side code to receive the notification and fetch the ID of the current device. There are third party tools that take care of part of the server side of things, offering dashboards that allow you to send targeted notifications among other things. Though I've not had any experience working with them, so can't say how well they integrate with LiveCode apps. Typically, an app that uses push notifications will already have a server component. Or will at least need one. i.e. there needs to be something remotely that is doing some processing and notifies the local app, like when an email is received or goal is scored. If the notifications are purely local, like time based reminders, then you can use local notifications. Which are a separate thing. Thanks for your detailed guide to "Certificate" based APN. Worked like a charm with the PHP sample as well. Hopefully Apple will continue to support "certificate" based APNs and not require us to use the "Token" based method - not all of us have HTTP/2 access etc.